Arcade racing games can be beautiful things. They don’t even have to be twitchy, they just have to feel twitchy. And the best of them appreciate that all you really need is steering, acceleration, brakes, and boost. While the number of racers seems intimidating, there is some level of avoidance on starting, so with a little care, it’s fine. Okay, that one’s subjective, but hey, less controls means more accessibility, and on the controls front, Horizon Chase Turbo definitely fits the bill. Everything is accessible on keyboard with one hand. And, while the game definitely has some twitchy sections, a lot of it is, essentially, the art of the overtake. Turning corners hard may get you round that corner for sure, but if you want to pass that car in front instead of bumping their rear end… Well, ease off on the turn a little, you can edge by ’em! Now, the thing with Horizon Chase Turbo is that, apart from completionist stuff, mechanically, it is very much “Does What It Say On The Tin.” The most complex part of it is boost starting (Have your revs in the green, not the red when the count hits 0, you get a boost), and everything else is aesthetic and track design… And the base track design is good. Good aesthetics, and only a few nasty surprises in the form of a couple of high chicane tracks early on. No, where it likes to get challenging (sometimes downright nasty) is for the completionists among us. You see, there are tokens. Get all the tokens and place first, you get a super trophy. Get all the super trophies, and a gold in the Upgrade race (Permanent buffs for all your cars, two stats at a time), and you unlock a new car. But these tokens have been the biggest source of retries for me, as some are placed in such a way you have to get each row, each lap, some are placed so it would be very difficult to get both rows in one go, and one track in particular in the early game raised my eyebrow a little, as the tokens are on the inside of one curve to the outside of the next. In driving terms, this is basically the hardest kind of line you can try to follow. 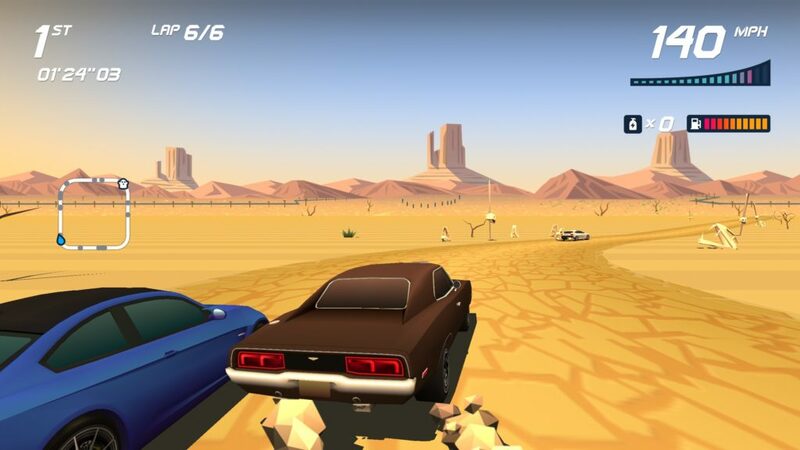 But the thing is, apart from that, Horizon Chase Turbo is really enjoyable to play. 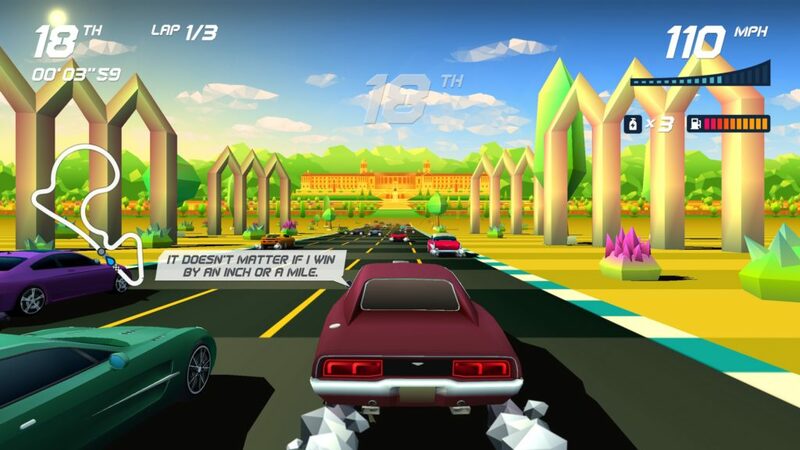 Its simplicity means you’re paying attention to the race, its music is good driving tunes, from rocking synth guitars to instruments that remind me heavily of Amiga soundfonts (The Amiga had a lot of racing games), it’s visually pleasing and clear, and, for the devs among us, there’s the fun note that Horizon Chase Turbo mimics the visual style of outrun (Which used sprite scaling to imply distance) by… Scaling the models as they become visible, essentially doing a 2D trick that was necessary into a 3D trick that isn’t, but adds directly to the feel. That’s classy. 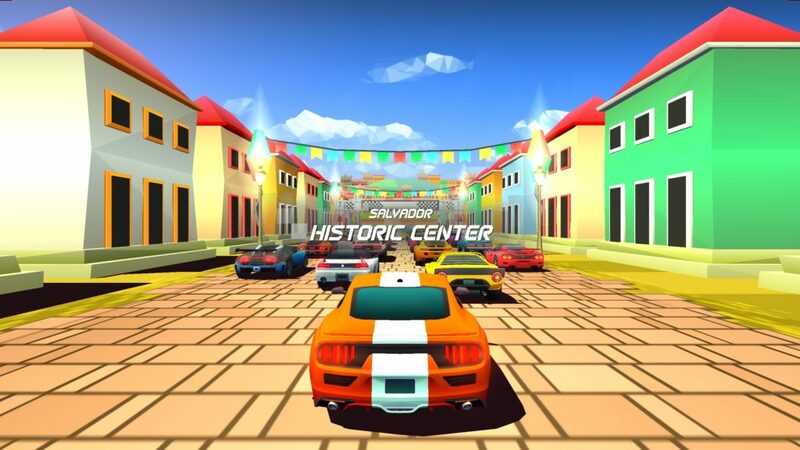 For a good look at a good way of doing an Outrun style arcade racer, or if you’re looking for a racing game that doesn’t have you tearing out your hair, Horizon Chase Turbo is definitely worth a look. 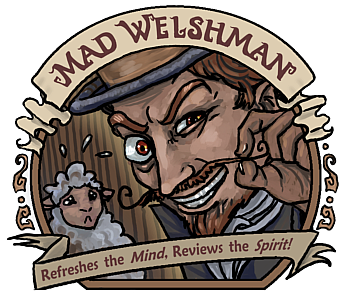 The Mad Welshman enjoys good arcade racing so much, he forgets release dates. Ah well, it’s good stuff. When you’re a data daemon down on your luck, sometimes even the shittiest of opportunities is a godsend. 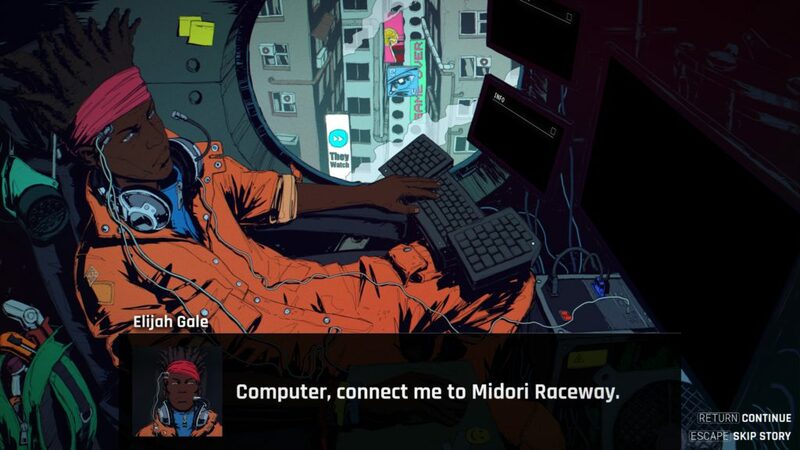 So it is for Elijah Gale who, having blown his last paycheck on a data daemon race, gets thrown into the world of… Rhythm racing hacking? 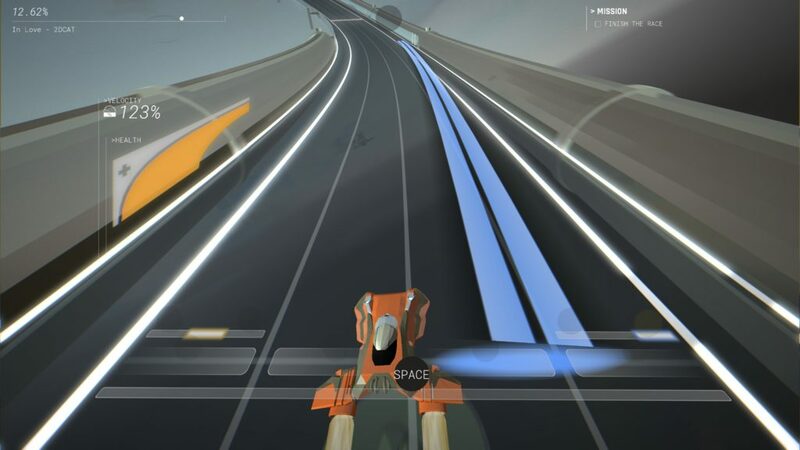 Joking aside, Sequence Storm is, as noted, a rhythm racer, in which you are juggling inputs that race toward you, hitting them (or holding them) at the right times so as not to damage your racer, and do jobs for corporations. Although the default keyboard layout is a relatively sensible one, controller is still recommended, as there are a total of 9 things you have to keep an eye on (four bars, four lines, and a jump… Not to mention having to steer when you boost), and hitting buttons and triggers feels somewhat more intuitive than “Shift up one key, quickly right one key, wait, two keys right, yada yada.” And, while the tutorial does a really good job of letting you know what’s what, it also lets you know that the gloves are going to come off relatively early, leading to hectic times. Helpful tip: The bars to jump seem to be at a slightly later point than either the lines or blocks. Why yes, I am a coward who screenshotted one of the lighter stretches. So it’s kind of nice, then, that the early tunes are among the most relaxing synthwave beats I’ve listened to in a while. Makes a nice counterpoint to my swearing when I inevitably screw it up. 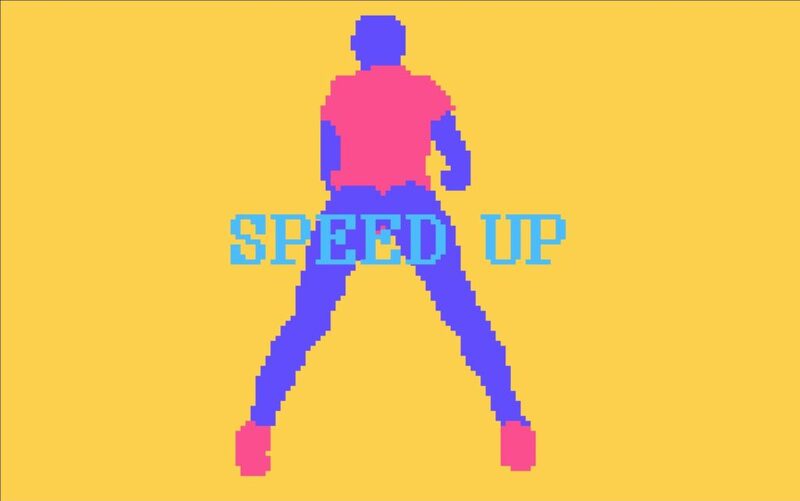 A good soundtrack, with intuitive beat markers, is a hallmark of a good rhythm game, and Sequence Storm definitely provides on that front, whether that’s the lighter tracks, or the grim saws and bass. 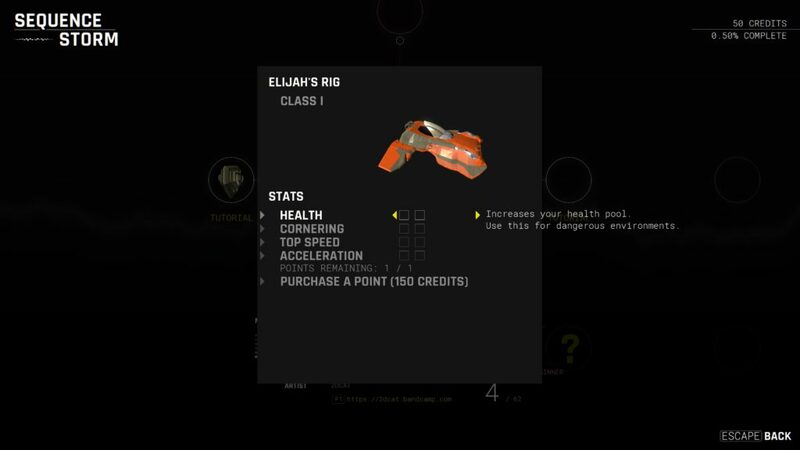 Aesthetically, it also works pretty well, whether that’s the comic style story segments (In which Elijah is trying to make his way in a world where AI have taken all the jobs), or the race segments, which have a low poly, visually clear charm. Now… The thing is, the gloves come off early, and the game is not forgiving. Jump bars, in particular, don’t give much room for error, and I very quickly found that anything less than good, long streaks is going to fail me a run. Although it doesn’t look it at first, it gets twitchy, and it gets twitchy pretty quickly. Does that make it a bad game? No. Its inputs are responsive, and you can, over time, build up that muscle memory, even with the track twisting and turning in an attempt to throw you off, but it’s definitely going to throw off newcomers. Add in a challenge mode later, and… Well, it’s a tough game, and I don’t think it makes any bones about that. Elijah’s Rig, in all its beautiful, low poly glory. Still, personally, I see myself coming back to it every now and again, despite finding it somewhat unforgiving, as the tunes are excellent, the visualisation is clear (and minimalist enough that there’s few distractions), and the story, equally minimalist though it is, is interesting. I would maybe like beginner mode to be a liiiiittle more beginner (Okay, a fair bit more beginner), but that is, honestly, me. The Mad Welshman does not dance. Well, not often, anyway. But he does like a good tune. 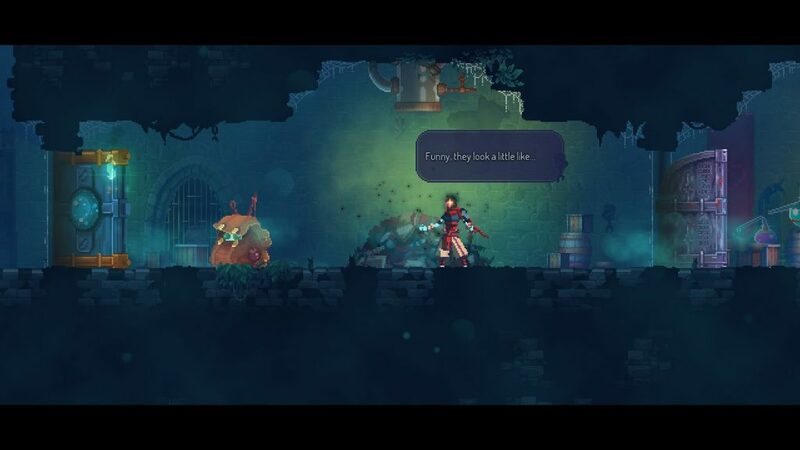 If you’ve looked at my past coverage of Dead Cells, you’ll know that I’ve been quite positive, and, over time, seeing things that I’d thought of as mild flaws within the game corrected, almost as soon as I thought of them. Motion Twin, as it turns out, have their heads firmly in the game, and now that Dead Cells is released? It’s pretty nice! 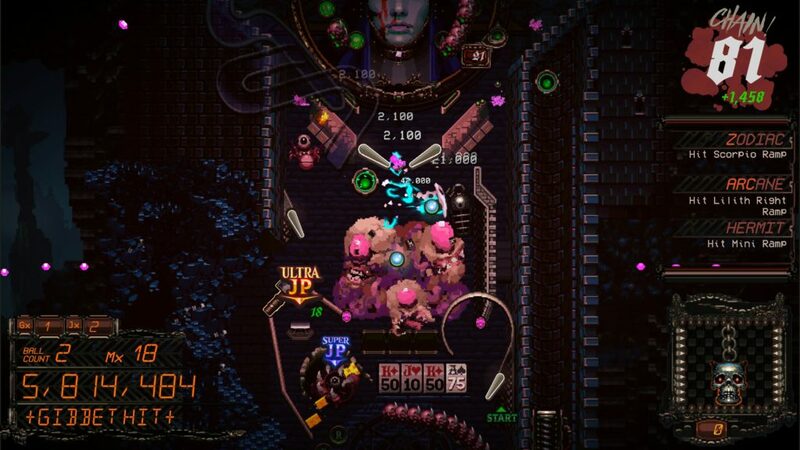 On the one hand, the game is a sort of deliberate twitch, in which you can hang back, but, in many situations, the best option is to get in there with one finger firmly controlling your dodge rolls, and the other on the weapon options. Combat with an enemy is never impossible, but the less you’ve found, weapon and power up wise, the more fraught it becomes. In the Ossuary, for example, I never quite feel comfortable without some damage over time weaponry, like the Blazing Torch or Bleeding Sword, because the creatures that live specifically there are meaty, often quick, and their general theme is to punish both the close and unwary. Considering I am occasionally the latter, and often the former… Well, something where I can throw it, hide away for a second, then throw it again in order to get through relatively safely is my touchstone. 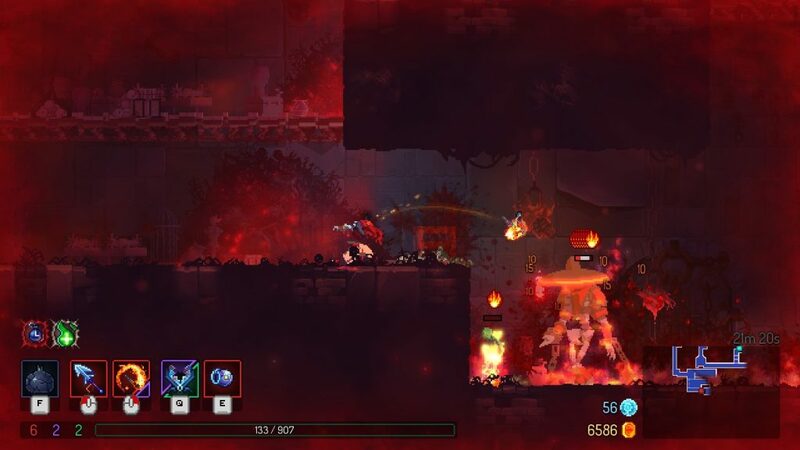 Part of the fun of Dead Cells, however, is that you don’t always get what you want, and adapting to the various weapon styles the game throws at you is important. Which makes it equally nice, then, that they’re easy to understand. Simple combos for each weapon mean that you very quickly “get” the weapon’s deal, and, equally, you can clearly see where there’s something you’ll be wanting to try and find later down the line. Somewhere. Somehow. Example: There are doors. They don’t open right now, but they’re numbered. I’m not worried. Sooner, or later, I’ll work out what they’re there for, on the routes I have available. Similarly, I see areas only reached with a walljump, and I say to myself “Aha… I have to get further to get that.” The more you play, the more, seemingly, there is to find. Although that will, no doubt, have its limits as the end approaches. It even has an interesting world, where, in the release version, Motion Twin have added something that was always subtly in the background, but is now available in a lot of the explorable lore of each area: Humour. This is, yes, an ooey-gooey game about smashing enemies into bits, before being smashed yourself, hopefully getting further each time, before being brutally killed and doing it all over again, from the beginning. But, as it turns out, our protagonist is a bit of a fish out of water. “Huh, all those bodies look a bit like… Me” , they think, examing what is presumably… Well, them, dead, over and over again. They do make the connection, but the subtle animation, the scratching of their slimey goop head, adds charm to it. The bratchests remain, just as bratty, just as into the act of being violently opened, and just as into punishing the player as they have been, but there are little bits where the protagonist lampshades the seriousness, such as the statue of the king. How did he see out of that helmet? Weird. So, it’s got humour, and subtle humour at that. 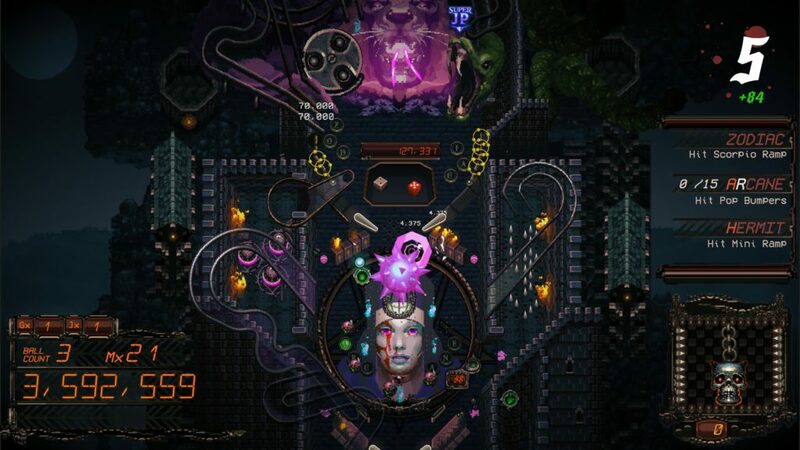 It’s got charm, it’s got good visuals, clean menus, and excellent sound design. 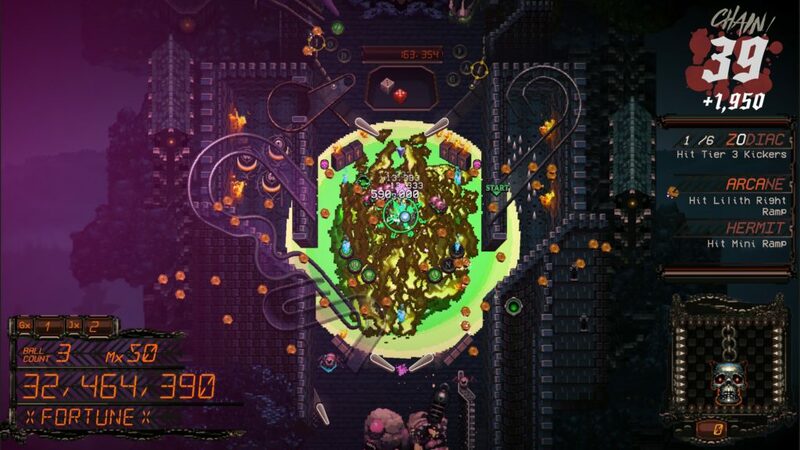 What it also has is its core game loop, and this, fellow readers, is going to be your make or break with Dead Cells. Are you, the potential player, okay with the fact that, no matter how many shortcuts you do or don’t unlock, no matter what new toys you successfully get (You have to complete a level to keep them, complete more levels to attain them, after all), you are, upon death, going to be sent straight back to the beginning, albeit with some things retained? Personally, the answer is yes, because it’s an interesting world, and I want to see more. But I can perfectly understand players who’d be put off by this, because, until a shortcut is unlocked (and you know roughly how to get there, and through it), every new area, every new miniboss, every elite enemy or even new enemies, are potential run enders. 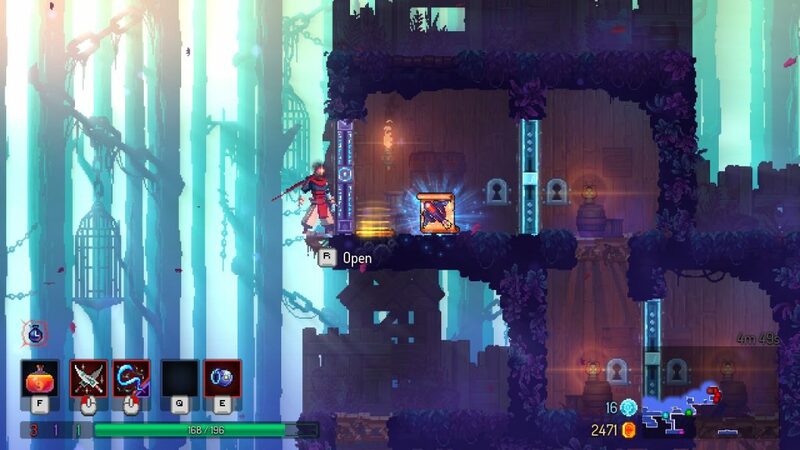 Many give visual clues to their function, but, in the end, how much you like Dead Cells depends on how comfortable you are with being sent back to Jail, Do Not Pass Go, Okay Fine You Can Keep This Much Gold. As mentioned, I’m fine with it. But it is a core part of the design, and I highly doubt it’s going away any time soon.